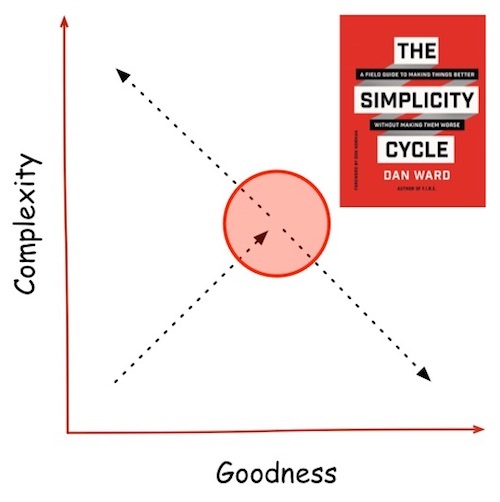 If I could ask my clients to read one book before we work together, it would be The Simplicity Cycle by Dan Ward. It’s not available for purchase yet. Dan was kind enough to send me an advance copy, for which I’m truly grateful, because it’s simply brilliant. At the heart of the book is an inflection point where the relationship between goodness and complexity flips. The problem is that people miss the point. Instead of clarity, they add clutter, always more, never less. I need my clients to see and understand this point. Everyone who designs products, services, and organizations should devour this book as soon as it’s published. In the meantime, here are a few quotes to whet your appetite. The solution may not require pushing harder. Instead, it may require rethinking our approach to complexity in the first place. When we can’t tell which pieces of information or which aspects of our design matter, we try to include everything for fear or missing something important. Wisdom involves seeing the patterns, seeing the connections, integrating information into meaning, and recognizing the limits of knowledge. Wisdom is about reduction, not accumulation.